Hang Zhou (Agenzia Fides) - An exhibition dedicated to the cartographic work of Jesuit Fr. 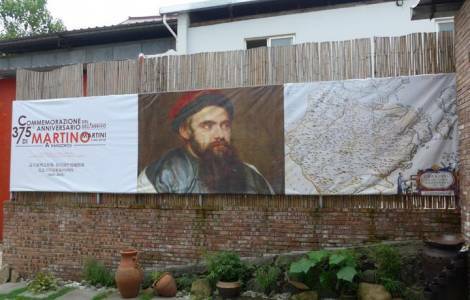 Martino Martini (1614-1661) was inaugurated at the headquarters of the China-Italy Center in Hang Zhou, the capital of the Chinese Province of Zhe Jiang, to commemorate the 375th anniversary of the arrival of the great missionary in the city. The inauguration took place on June 2. Hundreds of academics and scholars, both Chinese and Italian, took part in the event, co-organized by the China-Italy Center for Culture and Trade, by the Martino Martini Italian Study Center, by Edulife Italy-China and by the Association for the Promotion of Chinese culture Abroad of the Province of Zhe Jiang. Martino Martini, in Chinese Wei Kuang Guo, historian, geographer, cartographer, but above all a Jesuit missionary, is universally recognized and appreciated as a pioneer of cultural exchange between China and Italy, between Chinese and Western culture. "His cultural contribution" underlined the President of the China-Italy Jiang Xue Ji Association during the inauguration "was also expressed through the various geographic maps of China displayed in the exhibition, which represent an invaluable historical heritage. A 'trophy' of the cultural, scientific and friendship exchange between China and Italy, between China and the West". The city of Hang Zhou has never forgotten Fr. Martino, dedicating him a commemorative monument that rises in the area where there was once the Catholic cemetery. It is a monument considered a historical heritage of the Province. The parish of Hang Zhou dedicated to the Immaculate Conception, built by Father Martini thanks to the donations of two converted women, is a place of living memory of the great Jesuit, who shared the same missionary approach as his confrere Matteo Ricci.